In the upcoming WoodTECH 2018 series being run for local wood manufacturing companies in September, wood scanning and optimisation technologies will be a key theme for the series. Major tech providers from Sweden, Italy and the US will be outlining new innovations and discussing recent installations. This week, in the lead up to the technology series we’ve included an in-depth review of 3D scanning technology for saw and planer mills written by Terry Arden, CEO, LMI Technologies. Both Peter Wiklund, LMI’s Business Development Manager and Mikael Jacobsson, Business Development Manager for another leading Swedish company supplying specialised wood processing measurement, monitoring and machine control systems, RemaSawco AB will be involved in the WoodTECH 2018 series in both Australia and New Zealand. The use of 3D scanning technology in the wood industry has evolved significantly since first introduced into saw and planer mills. 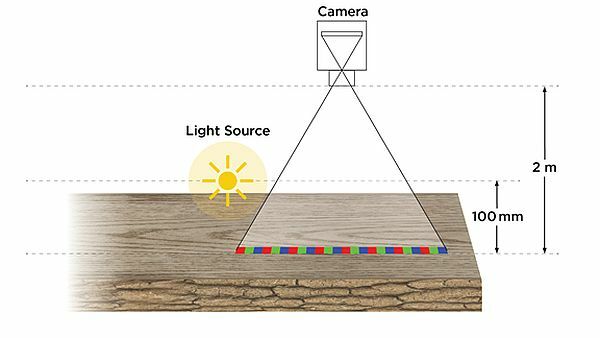 Initially, 3D scanners were used to measure the shape of logs and boards in order to extract the greatest amount of lumber from the wood (i.e., volume recovery). Today, complementary technologies are used to extract the highest quality from the wood (i.e., value recovery). Color imaging systems are essential in generating the high-resolution images required for surface defect detection, which leads to grade-based cutting decisions. Building a color scanning system requires a color camera, a lens, and lighting. The color camera can use either linear or area scan camera technology. The choice of which of these two technologies to use affects the overall design of the color system. Understanding linear vs. area camera operation is the key to picking a lighting solution that offers long lifetimes. A linear camera chip consists of one row of pixels. A lens is chosen to map this row of pixels to a suitable resolution across the board length––for example 0.5mm/pixel. To scan a board moving on a conveyor along the board width (transverse scanner), an encoder is used to track motion and trigger the camera one row at a time, at a suitable resolution across the board width––for example 0.5mm (Fig. 1). This is how a 2D color image is created of the board surface with 0.5mm x 0.5mm pixel resolution. Pixels are mapped from the board surface to a linear camera, with transverse board motion. The full article can be viewed here. Full details on the WoodTECH 2018 series can be found on the event website. REMEMBER, if looking to access discounted registrations to this event, these FINISH today.